Looking for the perfect Biltmore wine to pair with this dish? We have just the selection for a truly tasty meal. 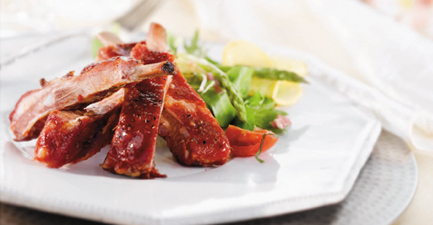 Combine all ingredients except spareribs and mix well. Rub each rib liberally with the rib rub. For these ribs, it's best to use an indirect smoker or barrel smoker. You can also use a Weber-type grill if you build a very small fire at one end and cook the ribs at the other. When using an indirect smoker or barrel smoker, build a small charcoal fire in the firebox and add 2 or 3 chunks (not shavings) of oak or hickory. Smoke the ribs for 2 1/2 hours, trying to maintain a constant 250-degree temperature. After 2 1/2 hours, brush the ribs with your favorite barbeque sauce, and smoke for 30 minutes more, or until tender.